Pumpkin Pie Spice is so easy to make at home. You can amp up the cloves and ginger for a sharper flavor, or the cinnamon, for a softer, cozier spice. I have an addiction to spices. No matter how many times I obsessively organize and consolidate my stash, it turns into a ridiculous mess within days. Eventually, it gets to the point where I can’t even close the cabinet door. Spices in full-on attack mode with the courage to jump out at any of us brave enough to open the door, it’s a thing that happens in this house with regularity. Please tell me I’m not the only one who’s been there. 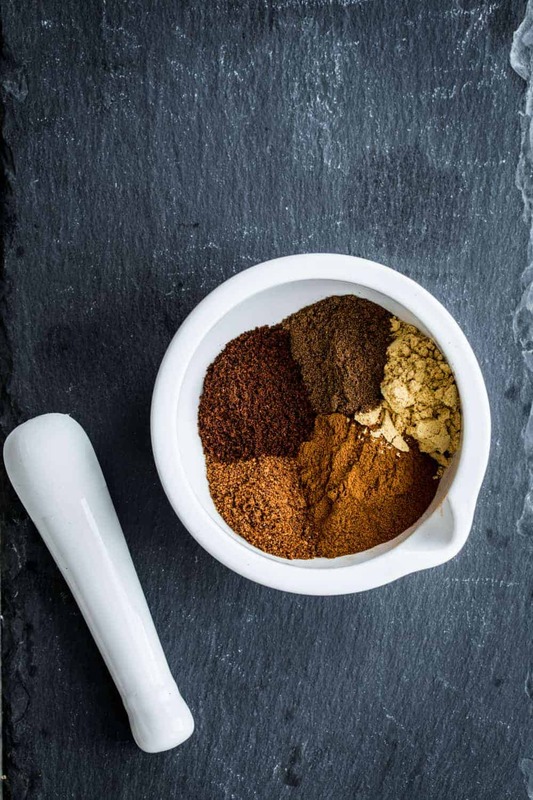 Buying particular spices for one dish and never opening the container again – let alone remembering that you actually have it buried somewhere on you pantry shelves. Yep, that’s me – I’m the girl with three containers of Garam Masala, but will totally run out of something common like chili powder twice in two months. I’m also a little lazy, so if there’s a way to cut a couple of corners without sacrificing the end result, I’m all about it! A few years ago, I found myself in the middle of a fall baking marathon and realized I was out of Pumpkin Pie Spice. My first instinct was to head to the store – but then that aforementioned laziness kicked in and I figured – wait a sec, I bet I can make this myself. And I did and it was splendid. This laziness-turned-inspiration is not unprecedented. I also make my own chili/taco seasoning, after running out on a rainy taco Tuesday when a grocery store run was not in the cards. It’s pretty darn rocking, and this pumpkin pie spice is equally as fantastic! The words “pumpkin pie spice” are everywhere starting as early as late August these days, but how many of us really know what is in pumpkin pie spice? 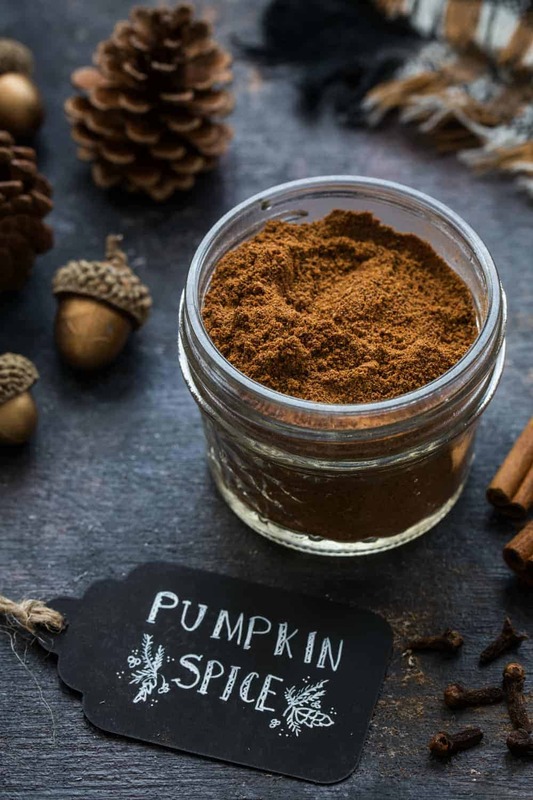 Pumpkin Pie Spice is just a combination of those yummy “warm” spices that we all reach for in our fall and holiday baking. Cinnamon, nutmeg, cloves, allspice and ginger -that’s it! 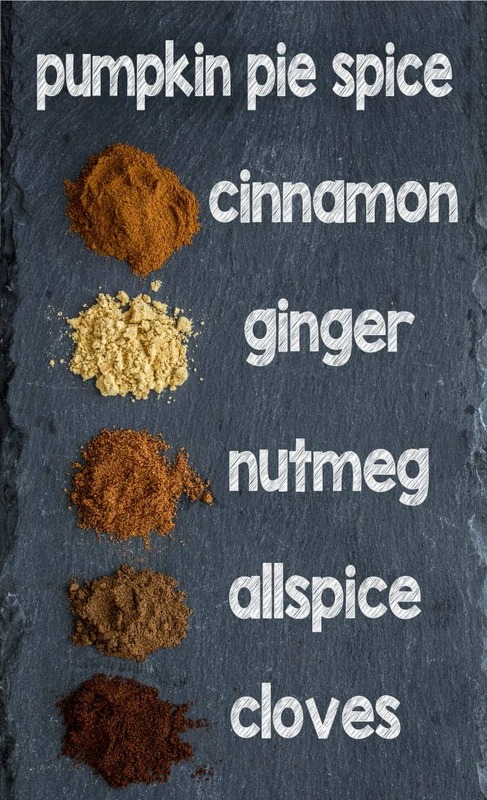 Now whenever a recipe calls for the typical blend of fall spices like cinnamon, nutmeg, etc. 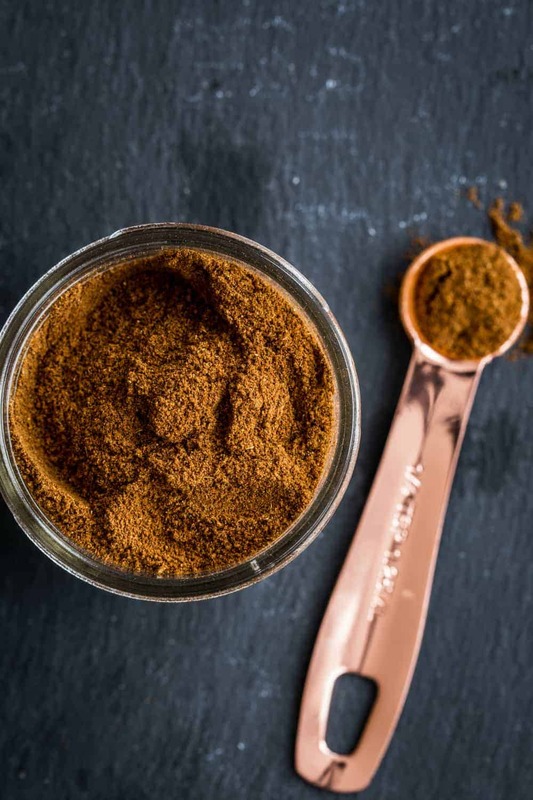 I toss in a couple of teaspoons of this homemade pumpkin pie spice. It’s better than any pre-made version that I have found and since you probably have all the spices on hand, it’s a little thrifty. And we all like thrifty, right? Plus, when you make it at home, you know for sure that those spices are all that’s in it -nothing else! 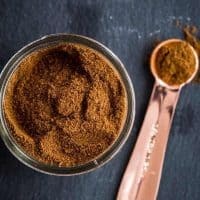 Making homemade Pumpkin Pie Spice is as easy (or, if you’re like me, tricky) as locating the 5 spices in your pantry. I measure all of the ingredients into a small Weck jar, seal it up and give it a good shake to ensure it’s well incorporated. Then you can smack a label on it and you’re good to go. Or if you’re momentarily obsessed with adhesive vinyl (that’d be me), you can go that route and cut out a nice font for your homemade pumpkin pie spice. Just store it in your pantry as you would any other spice and you’ll have all the flavors of fall at your fingertips. 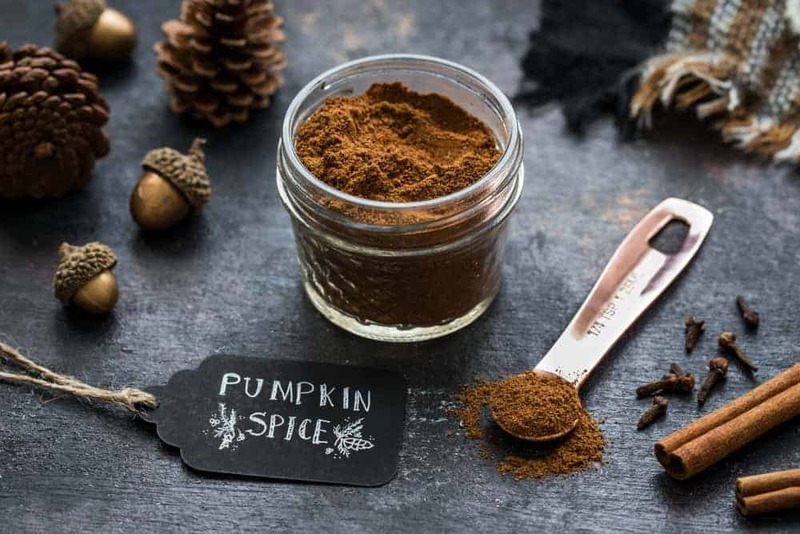 You can even make your pumpkin pie spice a bit more customized by bumping up the ginger and cloves, for a sharper, more robust flavor, or go light on those and amp up the cinnamon for a softer flavor. When you make it yourself, you can make it JUST right, and that’s worth doing at least once every fall. Now that you’ve made homemade Pumpkin Pie Spice, it’s time to use it in a recipe! Pumpkin pie is an obvious choice. I like a twist on traditional pumpkin pie, such as Mini Pumpkin Pies and Marshmallow Pumpkin Pie. You know I can never get enough cheesecake. Try my Mini Pumpkin Cheesecakes or No Bake Pumpkin Cheesecake. Homemade Pumpkin Pie Spice is also perfect in breads and cakes! Pumpkin Roll is a Thanksgiving staple in our family, as is Pumpkin Bread. I’ve even used Pumpkin Pie Spice in some sweet snacks, such as Pumpkin Spice Marshmallow Dip, Pumpkin Spice Chex Mix, and Pumpkin Dip. Combine spices in a small bow, mix well to combine. Store in a small jar or spice container. This post for Pumpkin Pie Spice was originally posted in September 2011. It has been updated with new photos and text, but the recipe remains the same. Yes! Was just thinking about making pumpkin pie spice the other day after seeing the $5.99 bottles that were mentioned above! However, at this point I figure I’ll get more grumbles from my boyfriend for making instead of buying since that would cause me to put all of the above ingredients on our shopping list :/ … I’m running low. Thank you! I love to put a dash of Pumpkin Pie Spice in my coffee in the winter. Or actually, in my hot tea. It just is so delicious in hot tea. I’m doing this, and pinning on my pinterest wall. So happy to hear you enjoyed the recipe and thanks so much for Pinning the photo. Have a great day. Sounds gorgeous! Exactly what I’ve been looking for….will give this a whirl. I am so glad to hear you enjoyed the recipe, thanks for coming back and telling us your thoughts! Have a great day. Hi Kristina, Would love to have your Pumpkin Cranberry cookie Recipe. Will you share it with me please? I’m starting up my pumpkin-inspired baking this weekend and cannot wait to use this recipe! What does “allspice” consist of? I live in Norway and love pumpkin pie, but pumpkin spice does not exist here. So I would love to try this recipe. Here is a link to Wikipedia that will explain exactly what allspice is. I hope this helps! Ever since mom passed, we have sisters’ day once a month and this would make a great homemade gift, cause they all love to bake and they would save $$$$$ in the long run. Thanks for sharing….. Since our mom passed, we have sisters’ day once a month and this would make a great, gift, knowing that the holidays are right around the corner. We all share recipes and fix fantastic meals to share with each other on those days. (Memories of mom’s fantastic recipes.) Thanks for sharing…. Yup, we have a drawer for the spices, and cupboard space for all the OTHER spices, the ones we only use once in a while. Never have bought pumpkin pie spice, though. I don’t like dried ginger– it’s fresh or nothing. And cloves don’t seem to agree with me. So I just mix up cinnamon and allspice half and half and I’m good to go! I am really curious about this chili/taco seasoning. I didn’t see if anybody else asked. So how do you make it? Yup you’re right….I have all the ingredients in my “spice” cabinet lol! I love using the tiny 4 oz Ball canning jars for spices. They’re the perfect size and the lids are easy on/easy off. Thanks for a great blend. I’m off to make some right now! Oh, and the little jars would be a lot easier to get a measuring spoon in and out of than the bottles the spices usually come in. I might have to buy a case of them next time I’m in the home goods section. What a great idea. On the pumpkin spice jars, is that a cricut machine that’s used for the tidy, clean letters on the jar? I sure like that look. I guess the individual letters could be purchased from Michael’s, but I like yours better. I actually used my Silhouette to create the letters. They were cut using a Felt Marker font. I hope this helps! I am so glad that you enjoyed the recipe. Thanks for visiting and sharing your feedback – Have a great day! actually Kmarket has been selling pumpkin spice, spiced pumpkin purée and Plain pumpkin purée cans in the American product shelf for years now. Silly to pay 10€ for 40grams of spice mix though! I am addicted to this Pumpkin Pie Spice and your Apple Pie Spice! I made this today, and I love it! Thanks for the recipe. Thanks so much for letting us know how the recipe worked out! Happy Fall! I stumbled on your site about a month ago looking for a good pumpkin pie spice for a batch of Pumpkin Ale I was brewing. When I mixed everything together I was a little worried because it seemed a slightly heavy on the cloves so I used it in some pumpkin ice cream as a test. Incredible!! Everything was perfectly balanced. After getting the beer wrapped up I went on and used this in pumpkin bread and a pumpkin rice-pudding recipe I found at the same time I found your site (I have a slight pumpkin dessert problem, eek!). Just tried the beer last night and I’m very happy with how it’s shaping up. I saw your Apple Pie and Chili/Taco blends and they are next on my radar. Thanks so much! That’s wonderful to hear! I’m so happy you are getting so much use out the recipe. I bet your beer turns out amazing! Have a wonderful day! Thanks for the recipe! I had the opposite problem. I didn’t think I had pumpkin pie spice so I made some. as I was going through my cupboards what do you know I found a container of pumpkin pie spice. You can never have too much this time of year! You’re very welcome and have a wonderful day. This is a great recipe to have for many reasons. I recently read the ingredients on a well known brand of pumpkin pie spice and found it contained sulfites! Sulfites are dangerous to many people and can kill. I am so happy to hear you enjoy the recipe – gross on the sulfites! Have a great day! I just wanted to say thanks for posting this. I used this last year to make a batch and I have finally used it up. I had to find the recipe again. So good! That’s wonderful! I’m so happy that you returned to the recipe to make another batch! Happy holidays and happy baking! I use this mix in my pumpkin butter recipe, PERFECT! I personally like a “zingier” version with about twice as much ginger as your recipe. So, yeah, I am addicted to ginger. :) It is a great idea and I do the same thing every year prior to Thanksgiving. It’s just handy to have a batch sitting around for pumpkin pies, cookies, cakes, whatever. just ran across your recipe for pumpkin spice. It sounds so good to have it all mixed ahead of time. I kind of got out of cooking an took easy rout —buying. Now yesterday I spent the day with my 94 year old mother at my house an we baked cookies. LOTS of them. I forgot how much fun it can be. So I’m stocking up to have things handy around . thank you for your recipe. Sounds good. Spices for tea coffee etc. Looking forward to a wonderful smell in my kitchen again. Thank you so much! you saved me a trip to the store, and this turned out devine! That’s terrific! I’m happy that I could save a trip! Have a great day and thank you for following MBA! Thanks for the recipe! We love to sprinkle it on apple & pear slices before we put them in the dehydrator! The kids love them this way! That sounds delicious! You’re very welcome. Have a great day and happy holidays! I love this mix! Any pumpkin recipe that calls for spices, I just use this mix as the quantity of spices they want added! Ex. recipe calls for 1 1/2 t cinnamon and 1 t ginger, I add 2 1/2 t of this mix! Make baking less fussy as I don’t have to pull out all the Penzey’s bottles! Thanks so much! Happy holidays and thank you for following MBA! I really like this mix in hot chocolate :) Sometimes I put just cinnamon but I find the mix is really warm and fragrant and good for Fall and Winter. I also make “chai” with milk or soy milk, brown sugar, maple syrup, this mix and one or two turns of fresh cracked pepper for heat. Tastes just like what you get from a coffee shop. can I make this without the allspice? Sure you can omit it. Thanks for visiting. So glad you found the recipe, Becky! Have a great weekend and happy baking! I hope you have the chance to try it. Thanks for stopping by. You will still have to use the baking powder and baking soda, but you should be able to use 1 tablespoon of the pumpkin pie spice in place of the cinnamon, nutmeg, ginger and cloves. I hope this is helpful. Thank you for this great recipe! Here in England you hardly ever find recipes that include “pumpkin spice” but I’m just making an American peanut butter/pumpkin granola recipe, so needed a spice mix. A hint: after I mixed up my spice batch, I labelled the jar with the ingredients so I can just fill it up easily, anytime. I am so happy to hear you find the recipe helpful! Thanks so much for stopping by! how much pumpkin spice would you add to sugar for storing for coffee? Could I have your apple pie spice recipe please? Can you leave out the nutmeg? I am allergic to it. Hi, Kayleigh! Feel free to leave out the nutmeg. I hope you enjoy it! I love this spice for making oatmeal. it is very expensive in the store. But this recipe is much better, thank you for the recipe. How can I do this with whole cloves? Do I smash them? Hi, Analiz! Use ground cloves for this recipe. Let me know if I can answer anything else. I hope you enjoy it! Thanks for this handy recipe. When the recipe calls for all these ingredients how much of the pumpkin spice do I use? Hello. You use equal measurements, if a recipe calls for 2 teaspoons of pumpkin pie spice, you’ll use 2 teaspoons of this homemade version. Thanks so much for stopping by. Happy baking! Wow!! Thank you for this recipe! I finally found some a few days ago after looking for weeks. Never be without it again! Thanks! Thanks so much for stopping by, Janie! I appreciate you taking the time to comment. Happy Baking! Nope, just spices! I hope you love it! Ohhh, I thought pumpkin pie spice is mostly made by pumpkin xo Looks so interesting! I cannot wait to try this! Just added a 1/4 teaspoon to my Crisped Rice Treats – amazing!!! Love it! So happy to hear you enjoyed the seasoning, Pamela! Thanks so much for stopping by and leaving your feedback!